Ceres Seeds’ original Cannabis Cup winner White Smurf has been renamed White Panther to honour poet, radio maker and cannabis hero John Sinclair who co-founded the legendary White Panther party in 1968. 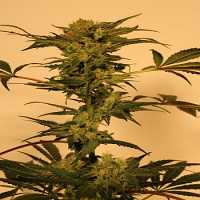 Indica x Sativa White Panther Regular Marijuana Seeds by John Sinclair Seeds: Ceres Seeds’ original Cannabis Cup winner White Smurf has been renamed White Panther to honour poet, radio maker and cannabis hero John Sinclair who co-founded the legendary White Panther party in 1968. Twice favourite with the connoisseurs at the High Times Cannabis Cup 2000! The multiple award winning White Panther, f.k.a. White Smurf, is the original white dwarf. It is an excellent strain, the connoisseur's favourite, and a multiple winner at the Cannabis Cup. It is a compact, white plant, with a dense cover of sparkling crystals. It is suitable for the 'sea-of-green' method, and will give a high yield in good conditions. 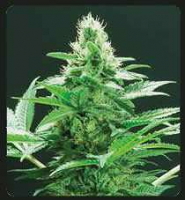 White Panther buds are sticky and delicious, and give an extraordinary effect. Fans of the White Panther highlight its smooth taste, pleasant daze and dreamy, sensual buzz. This is the perfect choice for anyone with a taste for excellence. The White Panthers were a American political collective founded in 1968 by Lawrence (Pun) Plamondon and Leni & John Sinclair. It was started in response to an interview where Huey P. Newton, co-founder of the Black Panther Party, was asked what white people could do to support the Black Panthers. Newton replied that they could form a White Panther Party. Thus, the group took its name in emulation of the Black Panthers, and dedicated its energies to "cultural revolution."